Spurned inventor comes back out of seclusion to renew research into how flying saucers are powered by taking energy right out of the air or aether. In 1967 I had the good (?) luck to figure out the workings of the Flying Saucer. The Propulsion System and how they are powered by taking energy right out of the air or aether. I built a small unit, went to 150,000 volts, got a heck of a poke and big bang was heard, the light went out. The Power Transformer on a pole 150 fee away had blown up. I was called out on business. When I came home a new Transformer had been installed. A squirrel was blamed. My TV and HiFi had been zapped. I blamed the Power Company, bought a slew of transistors and fixed the sets. Being on of these Good Neighbors of which you read in funny Novels, I fixed all sets for free but did not experiment at home anymore. Next experiment was in the “sticks”. I got a lightning strike on the tree under which my Van was parked, set it afire, scared the daylights out of me and some poor farm dogs, which were instantly transformed into the fastest whippets you have ever seen. As a good Patriot I decided to offer the invention as a Birthday Gift to Canada. Canada was 100 years old! It was looked over by the National Research Council, the Scientific Arm of the Canadian Government. They concluded I was an Idiot. Nobody could ever invent the device I claimed to have invented, it said in the Physics Books that it was only a theoretical problem, originating by Faraday in the mid 1800’s. No matter how many times I wrote and explained, they finally wrote to tell me that my letters would be henceforth in the wastebasket, unopened. Eleven years later, my (US) Patent Lawyer phoned me that the Patent was going to be granted. Dr. Kahn of the Hudson Institute had told him that it had been evaluated at $600 Billion if the USA would have it before Russia. That was for the Space Application alone! I wrote once more to the NRC. It was still ridiculed. I asked my MP to intervene. Four months after the patents were granted, the President of the NRC, Dr. Schneider, wrote a highly insulting letter (regarding me) to my MP., copy to the Premier, Mr. Trudeau, about this idiot, who did not know anything about Physics and could the Government do something to stop me from pestering them with his nonsense? I wrote a polite letter to this President, stating that someone must have mislead him, as I had the Patent now. I enclosed a copy of the Patent. I offered to come to Ottawa and have lightning come out of the clear blue sky. No answer. They tried it and the NRC Buildings were hit twelve times inside one hour. That item was even in the Newspapers! Now they had lost “face”. They decided to keep on denying and poohooing this minor invention. In the USA it went to the Propulsion Lab of Nasa in Cleveland, Ohio. The learned gentlemen there were aghast. Who would need them if we could fly to the Moon in an hour or Mars inside a day? They were being paid big bucks and were not going to kill the Goose that laid Golden Eggs and (of course not) kickbacks from the different suppliers. After the space disasters I believe that they decided to experiment with it and not knowing abou precautions to be taken blew their own Power Transformer Station to Kingdom come and a poor innocent tree was blamed for the blackout. One year after I got the Patents I went finally on the Web and read about a certain MR. Tesla. I realized that he had discovered the same thing. Two years later, while in the hospital with a heart-attack, due to a severe allergic reaction with Cashews. of which I had eaten a tin instead of making a TV dinner when my wife was visiting friends 600 Miles away, my wife came back home. She found the stack of rejecting and insulting letters and concluded that they were the reason for the heart attack. She did not want me to work on it anymore, the strain was too much for her. Love won. She passed away two years ago and now I am working on it again. First a unit that takes power out of the air to keep an industrial device with a 72 volt battery constantly charged. Next, a unit for home power. Then the real electric car like Tesla had. Next the power for air- and spacecraft. The fourth industrial revolution is coming. To ensure a long and happy life, I have given the complete circuitry to trusted people in Canada, the USA and Europe. If anything would happen to me it will be splashed all over the internet. The units will be leased, so as to get a constant income and keep the Tax man happy. Here in Canada the Ontario Provincial Government is not interested, the Politicians have their fingers in the Energy Pie, e-mail and faxes are not answered. The Federal Government referred me to the Minister of the Environment who is all hopped up on getting the funding of many billions of dollars to bury Nuclear waste. No answer from him either. For 100 Million Dollars we could fly it to the Moon or dump it at Jupiter. A real spacecraft can be as big as a football field and be crewed like a Naval Cruiser. Don’t worry, the US Navy People were not interested, neither were the US Marines interested in a floating of flying vehicle to be used in hilly country like Iraq or Afghanistan. The poor Oil Barons in Calgary got $510 Million to fight pollution. With $5 million I will get better results than they ever will get. Patents are expired but I left one insignificant item out to ensure that an unfriendly power would not be able to use it. When I get enough capital I will have to take at least 1000 patents out. There are myriads of applications. It is like inventing the wheel. Of course I might be on the wrong planet this time around. You also will understand that it is not something that should go to a University. Any disgruntled student could zap all the Computers, Cell-phones and even car computers. I think that it is more of a Professional Jalousie than anything else. After doing a stint in the Netherland Marines (trained in Camp LeJeune for the invasion of Japan, which was stopped by the Atom Bomb), I went for a few years to Indonesia, came home and finished High School in Holland. (Only 24 subjects, all compulsory for five years, most subjects are by that time on the level of two years University). Discovered in my spare time that a Diode could be made to amplify on short waves. Picked up daily for one hour Police Broadcasts from New York and Chicago on the two or three meter band. Built a circuit that would give one Audio Power Output Tube a push-pull output. After graduation I trained for a few years as a Steinway Tuner/ Technician and invented the “Tuning Felt” now used by professional Piano tuners. Then I got a position at Philips as a Techwriter. After three days, reading the Philips Technical Publications, where it was explained why they had a light colored Mask around the outside of the picture tube, I suggested the use of a Fluorescent Tube around the picture tube and was called an idiot. It would give distortion and interference. Later used by Sylvania as the “Halo-Light TV” The Push-pull circuit was no good, as their calculations showed no output. Stupid idea! Later used in the US as the Circlotron amplifier. I decided to emigrate to the USA. The waiting list was as long as the distance from Florida to Hudson Bay, I went to Canada instead. Then my stupid inventions were used and published and the Philips Engineers decided to look in all these other stupid ideas of mine. Yes, a diode could be made to amplify on FM and Radar frequencies. The Varactor Diode Amplifier, now used in every Radar Set around the world. No credit to me. In 1967 while trying to get funding from the Ontario Development Corporation, the Degreed Engineer told me that I could not have invented it as I had no degrees. When I countered that neither Edison or Bell had any degrees, he told me angrily: “Do not compare yourself with these men, they were REAL inventors!” No funding. The Capacity Changer, in all its simplicity, is a pulse-converter of the Coulomb charge upon one plate of a two-terminal capacitor, which becomes a capacitor having only one terminal when the plasma stream inside of a glass tube (commercially available ultraviolet lights) extinguishes. The plasma serves as the disappearing capacitor terminal of the Capacity Changer device. In 1933, Hitler ordered his Engineers to build a Flying Disk, that could come off the ground, without any sound, could fly at great speed, without any sound, and it had to be invulnerable. His engineers had read about Vandegraaff’s ideas. The Vandegraaff is a monopole high voltage generator, to a degree. Vandegraaff thought, that if he put his sphere to ground,and charged it up to five million volts positive, the sphere would be positive, the ground would be positive, and plus repels plus, ergo: Liftoff. So he was invited to come to Germany to do it. But when the sphere was on the ground, it only went to 3000 volts, and that did not do a thing. So in 1937 they switched to magnetics. And yes, by 1941, the day before Hitler invaded Germany, they had reached a weight reduction of their Flying Machine of 120 pounds. Trouble was, the machine, which even looked like a Flying Saucer weighed two tons. So Hitler scrapped it and went in with the rockets. Seeing a picture of a Flying Saucer in 1967, and noticing these spheres underneath, I asked myself where we use a sphere in the physics literature. Two metal concentric spheres form a capacitor C.
This is charged up to a potential V.
The remaining sphere is a 1-terminal capacitor with a capacity c.
The potential on this sphere is C/c x V. If C+ 1 microfarad, and c = 50 micromicrofarad, and V = 1000 volts, we get a momentarily pulse of 20 million volts. And that is positive all alone, or negative all alone. Of course that is difficult to do with these spheres, so the books caution that it was “Just a theoretical problem”. But what if we can make a 2-terminal capacitor that can be charged up, and then can be changed into a 1-terminal capacitor? That is what I invented 30 seconds after thinking about it.. This type of capacitor is inside every sphere, with the 1-terminal part connected to the sphere. As no charge can exist inside the sphere, it flows to the outside. If a sphere sits on the ground, and gives such a pulse, the first pulse may not do much, but the succeeding ones do. Earth will repel that sphere. And once off the ground, the electrical field off the sphere (with succeeding pulses) “sees” the earth’s magnetic field as “ground” and tries to get away from it. And that is how it works. The saucer shape is nothing but a reflector. Steering is accomplished by applying the proper amount of power to each sphere with a joy stick. A sixteen year old girl with heavy glasses and normal IQ could fly it. Offered to Canada as a birthday present in 1967, it was ridiculed by the NRC (Canada), as nobody ever could invent such a capacitor, and as thus it was rejected. Confronted many years later with the patent, they had to lamely admit, that it could be done after all, but the NRC (Canada) was &quotSure that it could not work, no funding!&quot. After which the President of that institution retired immediately But not before exhorting his successor to keep this invention in the ridicule section. His successor became head of the Canadian Space Agency. If you apply for a patent, you need the signature of two witnessse, who declare that they understand the invention. And he told me about Hitler’s Flying Machine that never worked. &quotWhen the project was terminated, we were sworn to secrecy about it, but that is nonsense now, you found it. .. Why did I not think about it before…?” He happens to be the world’s foremost expert on the parts to make this capacitor. Offered to Nasa, the Rocket Experts at the Propulsion Lab, where I was referred to, were &quotNot interested, thank you. !” You can figure out why. We can fly to the Moon in three hours, if need be, uncomfortable. Or in comfort, using a constant 1.1 g acceleration in two days. Mars in a few weeks. No osteoporosis and no barfbags. The Space station and all that nonsense is obsolete. Of course, anyone who can find out how a Flying Saucer works must be an idiot. that is, what I was told at the different &quotScientific” Institutes in Canada. Invention was evaluated by Hermann… (forgot his last name) of the Hudson Institute for Strategical Studies at $600 Billion. Now probably Trillion. Found 1200 applications, from &quotStarwar” cars that float, electrical engines that need only a battery to start, airplanes that reach any place on earth in two hours, all VTOL, no airports needed, to inexpensive power generators, weather control, tornadoes, hurricanes, earthquakes etc… Oil as an energy source will be out. No pollution and no noise. Just new to the net I will probably get my own site and start to advertise some applications. I have to make some money too. I wondered of course why the Patent Office never figured that this invention should be &quotclassified”, but you never argue with the dumbells that look after your security. Your security Council was informed before too. Threaten the President of the US, and CIA and FBI will be at your doorstep in five minutes. If all of the US could be in danger, if this invention is used by another party, who cares… Do have a nice day. Draw a circle on a piece of paper. This represents the sphere. Now draw a capacitor inside that circle (A capacitor is drawn, electrically, by two parallel lines that do not touch. Make one of the lines solid, and draw a connection to the circle (sphere). Draw the other line in stipples like – – – – – -, with swiches on both sides of the stipples / – – – – – – . They are in the ‘on’ position, and that side of the capacitor is active. Now we put both switches that are connected to the battery in the ‘off’ position. That capacitor is still charged, and the sphere would show 12 volt negative. Now the switches connected to the stipples are put in the ‘off’ position. That makes that side of the capacitor disappear, the solid line is left, and still connected to the sphere, as a 1-terminal capacitor. That is 1,000,000 / 50 =3D 20,000 times smaller. But the voltage goes up 20,000 times. You get momentarily 240,000 volts. and that is negative in nature, like the solid line of your capacitor. And it carries the whole charge of the 2-terminal capacitor. This part is connected to the sphere. If that sphere rests on the ground, the ground will try to absorb that voltage. But we, very cunningly, repeat the process, fast. And the ground gets another mouthful. But after a few mouthfuls, that part of Mother Earth gets fed up, and rejects the next appetizer. The sphere comes off the ground. Sure, the ground will then become obstinate and eventually become positive right under the hovering sphere, which would attract the negative sphere, and as positive attracts negative, crash it, accompanied by a short-distance lightning stroke, but the idea is to get away from it all, and after ‘rejection’ use the earth’s magnetic field to take off to higher realms. There will be a few guidelines for future Flying Saucer operators, probably on a computer screen. A Flying Saucer does not have silicon type spheres underneath, but metal ones. They are 1-terminal capacitors. Inside each sphere is a capacitor, that can be changed from a 2-terminal capacitor into a 1-terminal capacitor. When in the 2-terminal capacitor state, it is charged up to about 20,000 volts or less. Then it is changed into a 1-terminal capacitor, with the 1-terminal connected to the metal sphere on the inside. The 1-terminal capacitor becomes now the capacity of the metal sphere. It is based on a practical application of a problem, devised by Faraday, written up in the physics books as impossible to do in practice. The problem, if you went to High School: Two concnetric metal spheres do not touch and form a capacitor C. This one is charged up to a potential V. Then the outside sphere is removed. The remaining sphere is a 1-terminal capacitor c. The potential on this sphere is momentarily: C/c x V.
Difficult, if not possible to do with spheres, which is the reason that the invention was ridiculed and the inventor insulted up to four months after the patent was granted. If C = 1/10 Microfarad (which is possible with the design) and is charged up to a potential of 10,000 volts, the charge is 1/10 Coulomb. When this capacitor gets changed into the 1-terminal capacitor ( a sphere of about 2 meters, with a capacity of about 100 pF ), the resulting electrical pulse is about 100 million volts. Now, a Flying Saucer does not have to go this potential to get lift-off, propulsion and at the same time take power out of the air, unless they would like to destroy a town like Sodoma or Gomorrah. These “Angels” were human, who came in a Flying Saucer. Tesla had an electric car, with an 80 HP electric motor, an antenna and some electronics. He drove it all the way from New York to Buffalo and back at speeds of up to 90 MPH. No gas. Just like a Flying Saucer, he took power right out of the air. He refused to tell anyone how it worked, as he realized, that the system could also be used to give every home on earth free electric power. He had designed the Niagara Falls Power Plant for Westinghouse and the investors (Rockefeller and Morgan) would have killed him. He did not patent it, but I did. My poor wife, reading all the letters of insult and ridicule, was very upset about it and did not want me to work on it, or she would have left me. She died recently amd now I am starting to work on it, slowly, as money is in short supply. Initial experiment in 1967, zapped all the HiFi’s and TV’s in the neighborhood (I fixed them all for free, but did not experiment at home anymore, as it also blew after a few seconds a big Power Transformer on a pole 100 yards away, luckily a Squirrel was blamed). Next experiment in the “sticks” had me lightning coming out of the clear blue sky, when I connected the device with a dog-screw to ground, and generated three pulses of 500,000 volts. Offered to Nasa’s Propulsion Lab in Cleveland, it was soldidly rejected by the engineers. “Thank you for sending us a copy of your patent!” Who needs a propulsion engineer, if we, when using this system can be on the Moon in a few hours or at Mars in a day or so, no matter where they are located at the time, and all that without barf-bags, heat-tiles, or ostoporosis? I believe that they tried it a few years ago and caused the big blackout in the USA and Canada, blaming a poor, innocent tree. They did not know about what precautions to take. Any other experiment that you are working on is just a novelty without any real desirable results. ABSTRACT : “The invention provides a capacity changer comprising at least one evacuated glass tube having an ionizable gas disposed therewithin and a pair of mutually spaced electrodes disposed within the glass tube and selectively connectable through a switch to a first power supply, the gas, when ionized, acting as a first capacitor electrode. A conductive coating on the outside of the or each glass tube forms a second capacitor electrode capacitively coupled to the first capacitor electrode when the gas is ionized, the first and second capacitor electrodes thereby forming a two-terminal capacitor. A second power supply is selectively connectable through a further switch between the second capacitor electrode and the first capacitor electrode when the gas is ionized, the second capacitor electrode further forming at least part of a 1- terminal capacitor when the gas is not ionized. The two-terminal capacitor formed by the ionized gas and the second capacitor electrode may be charged and then, when charged, converted into a one-terminal capacitor formed by the second capacitor electrode. In this way, very high voltages may be attained”. Abstract : A capacity changer device in which there is a first capacitor means of the 1-terminal capacitor type, and an enclosing hollow metal sphere enclosing the first capacitor means which may be spaced therefrom and being itself a 1-terminal capacitor with a current power supply for energizing a number of evacuated glass tubes containing an ionizable gas and forming part of the first capacitor means. It includes a second power suppy for direct current for charging the first capacitor means and connected also to the metal sphere for combining the charge to form a combination with the sphere of a change to a 2-terminal capacitor. This invention relates to improvements in capacity changers, and particularly, the change in capacity occurring when a small-value 1-terminal capacitor is changed into a substantial value 2-terminal capacitor, or vice versa. SUMMARY OF THE INVENTION : An object of the present invention is to provide a capacity changer and its construction whereby there is achieved a change in capacity occurring in changing a small-value 1-terminal capacitor into a substantial value 2-terminal capacitor, and vice versa. Another object of the invention is to provide the means for producing high potentials which can be positive or negative in nature and which are adapted for use in the study of nuclear structure and nuclear reactions. Still a further object of the invention is to provide a novel and improved means for constuction and operation of a high power particle generator. Another object of the invention is to provide a novel and improved device for generating potentials of either positive or negative nature of such magnitudes so as to attract, bend or repulse radiation. Still another object of the invention is to provide novel and improved construction of a device for generation of potentials of either positive or negative nature, to attract or repulse mass. A further object of the present invention is to provide novel and improved means and its construction for making an inexpensive, yet effective Intense Neutron Generator with possibility for slow to fast neutrom emission. Still a further object of the present invention is to provide a novel and improved construction of a high power Radio Frequency Transmitter. Another object of the present invention is to provide the means to generate strong electrical field which can be used to counteract other electrical fields or in conjunction with suitable electronic circuitry to detect interruption of said fields by the infiltration of foreign metal bodies, ore bodies, etc. These fields can be extended to several miles and are not affected by hot and cold layers of water. Still another object of the present invention is to provide a novel and improved means which makes the generation of super high potentials possible, without having to resort to insulators that would be prohibitive in size or cost. FIG. 7 is an elevational and schematic view of a composite arrangement including several of the tubes shown in FIGS. 5 and 6 mounted inside a hollow metal sphere, with related power supply sources. BACKGROUND OF THE INVENTION : In the past, the changing of 2-terminal capacitors to 1-terminal capacitors have been regarded largely as theoretical problems and devices. As for generators of high potentials, (in excess of 10 MeV), positive, negative or alternating in nature, they have been seen to be costly, cumersom and to need a fair amount of insulation. The present invention seeks to provide means and construction for attaining the foreging objects at relatively low cost and with good expectation of rewarding results. DETAILED DESCRIPTION OF THE PREFERRED EMBODIMENT : In order to understand clearly the nature of the present invention, and the best means for carrying it out, reference may be had to be the drawings in which like numerals denote similar parts throughout the several views. FIG. 1 shows a simple capacitor consisting of two conducting plates 10 and 11 which are separated by a dielectric medium 12 which may be air or other insulating medium. On the other hand, there is shown in FIG. 2 a 1-terminal capacitor 13 which consists of only the single flat conducting plate 13. As shown in FIG. 3, there is depicted another type of 1-terminal capacitor 14 consisting solely of a hollow sphere 14. Formulae for the calculation of the capacitance of various shapes of 2-terminal capacitors and of various shapes of 1-terminal capacitors as shown in FIGS. 1, 2 and 3 are well known and given in various textbooks on electricity. The following shows how such elemental knowledge of capacitors is applied in development of the present invention in a novel form and construction. In FIG. 4A, the schematic circuit diagram shows the capacity changing circuit consisting of a 1-terminal capacitor 15 consisting of a plate 16 which may be cylindrical in shape, and encloses or goes around a non-conducting gaseous discharge tube 18 made of sealed glass or the like material, with electrodes 19 and 20 inside the tube, and which is connected via lead wires 21 to a battery 22 through a switch 23. In FIG. 4B, the schematic circuit diagram shows the realization of a 2-terminal capacitor 24 consisting of a plate 25 which may be cylindrical in shape which goes around a gaseous discharge tube 26 which is conducting. The ionized gas 27 within the tube 26 acts as the second plate under the influence of the voltagee from battery 30 delivered via lead wires 31 through the switch 32. The capacitance is indicated by the broken lines 33. As seen in FIGS. 5, 6 and 7, the basic capacitor of the present invention consists of one or more hollow tubes 34, 34A or 34B, which may be round, cylindrical or any other shape and made of non-conducting material such as glass. All of the tubes have end walls 36 at each end thereof and electrode terminals 38A or 38B are inserted through the sealed glass ends. The tubes are evacuated of air and filled with an ionizable gas 40 such as neon or argon, under suitable pressure. The tubes are partly covered with a conducting substance or coating 42, leaving the electrode terminals 38A and 38B free and insulated from the substance 42. The outside surface of each of the tubes 34, 34A and 34B are now for our purposes substance 42, which is a 1-terminal capacitor. I have found that is is commercially advantageous to use a tube which does not have a phosphor coating, but which is otherwise similar to those used in the lighting industry. This type of tube, shown in FIG. 6, has heated filament-like terminals which make it possible to construct a high speed or fast-firing glow discharge circuit with a lower firing potential. Thus, FIG. 5 shows the tube 34A drawn as a glow discharge device, using power supply 50, switches 51 and 52 and electrode terminals 38A. FIG. 6 shows the similar arrangement but with tube 34B connected to the power supply 54, including switches 55 and 56 and starters 57 at each end as is known in fluorescent lamp art. Looking at FIG. 7, there is shown a hollow metal sphere 60 with a spherical chamber 62, with a number of tubes like those shown at 34A and 42 in FIG. 5 or at 34B and 42 in FIG. 6 inside the chamber 62. The sphere 60 acts also as a 1-terminal capacitor, having its own capacity (C equals 0.556 d) and C is the capacity of pF, and d is the diameter of the conducting sphere in centimeters. Even if each tube 34 has its conducting surface 42 connected to sphere 60, the capacity of the sphere remains the same, namely (C equals 0.556d). If the gas 40 inside the tubes 34A or 34B is ionized by an ac or dc power supply 66 through wires 68 and the switches shown in FIG. 7, and electrode terminals 38A and 38B as seen in FIGS. 5 and 6, a 2-terminal capacitor is formed herein called capacitor 70. Ionized gas 40 in each tube forms one plate and the conducting surface 42 forms the second plate. The glass tubes 34A or 34B are the dielectric. This 2-terminal capacitor 70 can be of substantial value, depending on the size, shape or number of tubes 34-42 used inside the sphere. It will be noted that, although the capacitor 70 can have a substantial value, the capacity value of the enveloping sphere 60 remains the same. Instead of mounting the tubes 34A or 34B in a sphere, they can be mounted in any other type of container with a conducting surface connected to the coating substance 42 by a wire 72 as shown in FIG. 7. However, for some purposes described herein, a sphere is the most efficient form. The 2-terminal capacitor array 70 can be charged by a direct current power supply 74, via switches 76 and 77 and conductors connected to the electrodes 38A or 38B on the ends of the tubes 34 on one side, and another conductor 78 going to the conducting coating substance 42 on each tube. Whether ionized gas 40 forming one plate of the capacitor or conducting coating substance 42 connected to sphere 60 as the other plate becomes positive or negative depends on the connection of power supply 74. Versatility can be achieved by using three-position switches or relays for switching at 76 and 77 of FIG. 7. After the 2-terminal capacitor 70 has attained a charge, power supply 74 can be disconnected from the capacitor 70 by means of breaking the charging path via switch 76 or 77 or both. The connection from power supply 74 to conductors 42 should be broken to safeguard power supply 74. The plate formed by ionized gas 40 in each tube can now be removed by disconnecting power supply 66 via switches 80 or 81 or both. When using a filament-type tube 34B as in FIG. 6, it is advisable to disconnect the filament-heating power supplies via starter switches 57 or both. When fast action is required in the changing to state from 2- or 1-terminal capacitor operation, the gas 40 can have quenching type additives as known in the art. The charge on the other plate (sphere 60 connected to conductors 42) remains. If capacitor 70 (2-terminal capacitor array) had a capacity of 10 microfarads (which can be attained by using a sufficient number of the tubes 34-42) and was charged up to 10,000 volts, the charge would be 1/10 Coulom (Q equals CV). If the capacity of the sphere 60 was, for example 100 pF (picofarads), the potential which is generated is momentarily about 100 million volts. It is thus seen that the invention furnishes solutions to various problems as mentioned above, and at reasonable cost of equipment and power supply. Although the invention has been described in specific terms, it will be apparent to those skilled in the art that there are many modifications, changes and improvements which may be made therein without departing from the spirit and scope of the invention as herein claimed. Further, if desired, the switching arrangements at 76, 77, 80 and 81 of FIG. 7 may be mounted inside the sphere 60, if convenient. A Vandegraaff can only deliver a very small amount of power continously. It is not accumulative. The capacitor/ sphere gets charged up in about 1 second, and releases that energy in less than one millisecond. 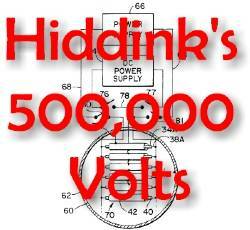 So with the values I quoted (Which are easily rational) you have 1 microfarad at 1000 volts, energy is 1 millicouloumb. Release it in one millisecond, and it acts as one coulomb. For energy purposes: If you have two of the same polarity, point charges (spheres) of 1 coulomb, one meter apart, the repelling force is one million tons. Make one of the spheres stationary and the other one rotatable, and you have a power generator. That is what you will have in your backyard, at a reduced scale, so you can heat your outdoor swimming pool in 40 below winters. Bigger space ships in the form of Zeppelins, can have repeller beams to stay up, and attractor beams, separately, that can beam you or anything else up. Like Science fiction of the 30’s, but it all can be done. Seversky had this problem so he made a large open space structure that he charged up so the ion wind would act as a repulsion mechanism much like a rocket ejecting mass instead of trying to use a concentration of charge to act as a lifter. Tell the guy to prove it! Sounds like he’s never done the proof of principle to me. – At 05:22 PM 7/10/99 -0500, Jerry W. Decker wrote: Hi Bill et al! That’s what I don’t get about this either…how does one get electrically ‘deeper’ or lower than the earth ground??????? Seems like you’d get reversed lightning, where energy would move towards the greatest negativity. The earth is the master reference of ground, meaning the lowest energy level, the lowest negative. When clouds build up a charge that is high enough in ‘pressure’/voltage to overcome the capacitive dielectric of the air, it discharges to the lowest negative well, which is the earth. Lightning sends out a very thin, almost invisible streamer, scanning the earth for the lowest potential, looking for an ingress through a point, if it can’t find it, it will take whatever path it can find to relieve the pressure. And there is reverse lightning that moves from the earth up INTO the clouds. As I understand reverse lightning, the earth is like a giant body of compressible fluid (electricity) which moves through the earth in pressure waves. Stubblefield and others who claim to have successfully tapped these currents as ‘earth energy’ say that mountain ranges and such act like a beach on which waves of these moving currents break, creating intensifications that can be tapped. Its a matter of connecting a load from a low energy density to a high energy density so that the differing pressures will equate THROUGH the load to do work. I think the problem here is the idea of what is a stable reference? And there is NO stable reference to my view, since the earth energy concentrations do change perhaps in clouds or waves and therefore the ground reference level must also change. The reference is the lowest energy level when compared with a higher level, that creates the difference of potential and if there is a conductive path, the higher potential MUST flow into the lower potential until they both are equal. So plus and minus are confusing, when really it is high potential flowing to low to simply achieve equlibrium OR is it this plus/minus thing coming to a neutral state OR is this comaring apples to oranges? That is the premise of aether tapping, that it is a high potential that is flowing into the lower potentials (holes in space) of matter, trying to fill it up, it precipitates as matter which must eventually redissolve back into energy (probably based on spin direction) because the mass eventually charges up so much with energy that it will dissolve matter back into energy, to again become one with the background aether energy level. Joseph says you charge up a mass to such a high negatively polarized potential that it must repel from the earth since it is negative also. I can’t see this happening because high voltage will eventually discharge in the form of a bolt of energy into surrounding lesser potentials, in this case the earth except that these are electrons that he is speaking about and they always repel other electrons. Even Ken Shoulder’s charge clusters are electrons that are foced to stick together like a bunch of grapes until they hit a conductive mass and then they explode in all directions due to the mutual repulsion. Now he could be referring to some kind of coulomb current except that implies positive to negative OR electric field lines but then again, it might be a direct aether/zpe interference which I doubt at this point since all prior reports of f/e or antigrav anomalies I’ve seen require alternating current, not the electrostatic DC. Electrostatics is the study of charges, or charged bodies, at rest. When positive or negative charge builds up in fixed positions on objects, certain phenomena can be observed that are collectively referred to as Static Electricity. The charge can be built by rubbing certain objects together, such as Silk and Glass or Rubber and fur; the friction between these objects causes Electrons to transfer from one to another with the result that the object losing electrons acquires a positive charge and the object gaining electrons acquires a negative charge. Electrodynamics is the study of charges in Motion. A flow of electric charge constitutes an electric Current. In order for a current to exist in a conductor, there must be an Electromotive Force (EMF), or Potential difference, between the conductor’s ends. Two particles of like charge, both positive or both negative, repel each other; two particles of unlike charge are attracted (see Coulomb’s Law). The electric Force between two charged particles is much greater than the gravitational force (see Gravitation) between the particles. Many of the bulk properties of matter are ultimately due to the electric forces among the particles of which the substance is composed. Hmmm….the greater the charge….as in the more electrons, the more repulsion from the earth. This leads me to CONCENTRATION OF CHARGES in a given area. The earth is a vast body full of electrons but SPREAD OUT over a wide area. If you measure the electron concentration in one area, it would be relatively weak, but taken as the whole body of the earth would be enormous. if electrons repel electrons and positrons repel positrons then how does difference of potential come into play since like charges repel, no matter what energy density they are? Wouldn’t this mean that the higher quantity of electrons MUST flow into the lower quantity of electrons by virtue of difference of potential trying to come to equilibrium? This flow business is destroying my little mind…and I can’t help but think I (we) are missing something which I hope he can clarify as he’s built the things and seen unusual effects. His descriptions about the Egyptian and holy water business is certainly new, at least to my view. The idea that you could use dirty or doped water to increase conductance I have no issue with, but I can’t see any amount of electrostatic energy lifting a mass USING ONLY ELECTROSTATIC ENERGY. However, IF there IS some kind of aether/zpe/gravity deflection taking place, now we might have a way of explaining it…. In support of this contention of ‘something about high voltage’ that we all are missing, the priest guarding the Ark of the Covenant says the stellae (obelisks) were cut and moved with the ‘celestial fire’ that comes from the Ark, a giant Leyden jar. The Farrow device using spiked electrical interruptions to lower weight. The Hamel and Searl devices, using self rotating magnetic disks that attract and accumulate tremendous quantities of ions to produce a plasma that makes the thing fly off into space (they glow different colors before they take off). The Hyde and Testatika electrostatic devices for pulling power from somewhere. His ‘take’ on the Perrigo device as an electret??? Now by god, that’s novel….and something Perrigo could have well done in 1911, used a high voltage DC to polarize cooling wax and make an electret. You’ve probably heard about the claim that you can build a giant electret, possibly in multiple stacks, like a big capacitor, one side is attached to an antenna to milk/recharge the electret. The other side of the electret is supplied to a load which is connected to EARTH ground. The energy from the electret is notoriously weak and I always questioned this idea but what if????? There are numerous historical reports of people who claimed and seemed to prove that they could tap enormous amounts of power from the air, so what is the secret? Perhaps someone out there has the plans or reports on this claim? I’ve seen it and should have bought the information, probably Rex Research. Maybe there is a combination of one or more electrets and a multi plate capacitor that has properties we don’t yet realize. With all these oddities, I won’t limit my thinking to say it cannot happen because of the normal electrostatic principles……what is going on is definitely NOT normal and precisely why most of us are here..….looking for weirdness or anomalies that we can duplicate and use for practical purposes…. I hope Joseph joins the list as he certainly has some refreshing views and seems to have picked up on something which correlates with all this high voltage stuff…he did say 1200 applications had been identified that the phenomenon makes possible.